You are here: Home / About Our School / Why Choose Navigate? BC families have more choices than ever before when considering education options for their children. By thinking outside of the traditional structure of classroom instruction, we are able to deliver more choices to families and make the most of the learning resources available. All of our courses and programs are taught by BC Certified teachers, ensuring that the standards of education set by the BC Ministry of Education are met or exceeded. Navigate has been recognized both nationally and internationally as a leader in blended learning, building flexible learning plans that work for each student. 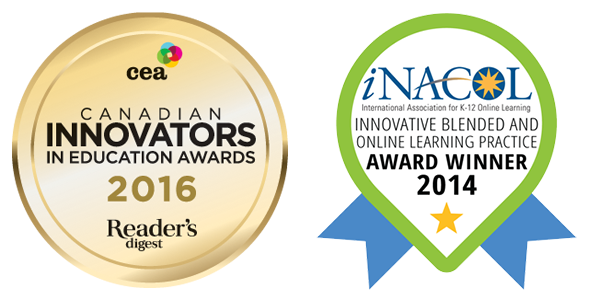 We are proud to have been awarded the prestigious iNACOL (International Association for K-12 Online Learning) award for Innovative Blended and Online Learning in 2014, and the 2016 Canadian Innovators in Education Award from the Canadian Education Association (CEA) and Readers Digest magazine. Our goal is to inspire learning that is meaningful at every stage of child development. We have decades of experience, a history of success, and a strong team of dedicated professionals. Unique: Learning is a personal experience for each student and we celebrate this by offering creative solutions to learning. We work with each student to help them find their personal “spark” to develop a life-long love of learning and a never-ending sense of curiosity. Connected: We support and encourage community so that students, parents, teachers, and community members work together to engage the students and provide an enriched personalized educational environment. Technology allows for K-12 students throughout BC to access online learning as well as face-to-face instruction. Our online learning space provides secure moderated forums where students can exchange ideas and learn from one another. Inspired by Community: We are interested in developing community mentoring relationships that provide a context and personal connection to curriculum. Flexible: Students and families thrive with greater flexibility and education options. The new BC curriculum is the foundation for this approach. Students can enroll as full time or part time students, and work at their own pace to complete their graduation requirements even while attending their current school. Personalized learning plans allow a focus on specific needs for Aboriginal students, special education students, and to provide mental health support in ways that classroom environments are not equipped to do. Accessible: As a publically funded DL school in SD71 in the Comox Valley, Navigate offers free online courses to all non-graduated students in BC. There are modest fees for blended learning programs, and tuition fees are required for adult students who have already graduated. Students from any school district can apply at any time throughout the calendar year. Supported: A Navigate education is highly resourced. We have decades of experience, a history of success and innovation, and a strong team of dedicated professionals who are open to finding new approaches to common goals.